A dear friend, since gone from her garden, used to buy long, lanky, unappealing plants on purpose. In the spring, she would look for stems on shrubs that had stretched and were just hardening but still a bit bendable. 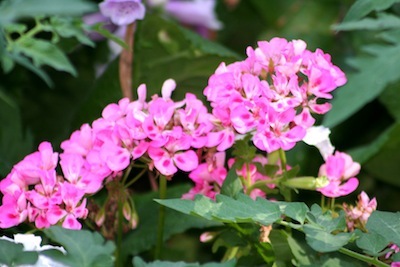 Perennials and annuals, too, were bought with an eye toward length rather than beauty. She would take them home, oftentimes late in the season at a reduced price, and make new plants out of the uglies. Take cuttings, with 3-4 leaf nodes, in early morning after a rain or watering. Later in the day, they won’t be as fresh or as likely to root. Keep the cuttings moist by wrapping the ends in paper towels and carry them in a plastic bag. Some cuttings are difficult to tell “UP” from “DOWN” so strip off the bottom leaves before you store them in the bag. At the gathering stage, you can also cut back by half any top leaves. If the tip is floppy, pinch it out. There really is no need to keep leaves on the cuttings, but we all feel better for some reason if there are at least parts of leaves on the stem. Do not be surprised or worry if they fall off. You can use a soil-less mix or straight perlite in pots as your rooting medium. Be sure to get it good and moist before you pot it up. The soil-less mix, especially, is difficult to get wet all the way through, so stir it up to make sure it is all wetted. When you stick your cuttings, use a pencil or something similar to make the hole in the soil-less medium. Bury the stem down two nodes. You will have much more success if you keep the cuttings misted every day. They should be either indoors under plastic to keep them humidified or outdoors in the shade. There is no real perfect way to propagate in the backyard. It is trial and error, hit and miss. I remember an Aunt cutting off pieces of her rose bushes and shoving them in the ground next to their “mother” rosebush. She then put a mason jar over the top, watered with a sprinkling can, and in about a month, had a new rose bush to pot up and give away. You can build a hedge from one plant or fill out a flower border with color from one perennial plant. Gardening on a shoestring is fun and not just for thrifty gardeners. We all love to watch new life develop. There are many more shrubs, trees, and flowers that can be propagated in the spring. Don’t be afraid to give a clipping, which you now will think of as a cutting, a try.